Caterpillars of cherry scallop shell moths (Rheumaptera prunivorata) are defoliating black cherry trees of all sizes in far southeastern Jefferson County and slightly into Walworth County. 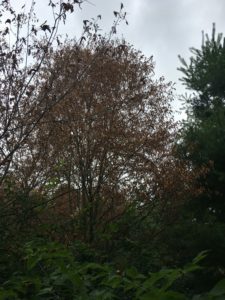 Many cherry trees have been completely defoliated. This is the third consecutive year of damage in this location. 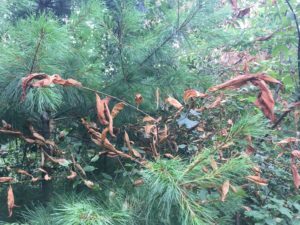 Defoliation by cherry scallop shell moth caterpillars has increased each year; hopefully natural enemies that typically cause the populations to crash show up soon and do their job as multiple years of defoliation is stressful to trees. 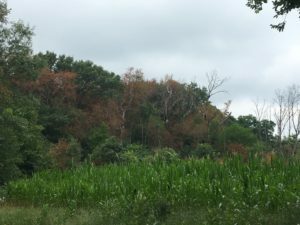 In addition to cherry scallop shell moths, there is concern about possible attack on black cherry trees by peach bark beetles (Phloeotribus liminaris), but none have been reported yet. The cherry scallop shell moth is a native insect that defoliates black cherry and other kinds of cherry trees. Typically, moths emerge in June to lay eggs. Caterpillars feed in groups. They form shelters by tying leaves together with webbing, in which they are protected from predators. 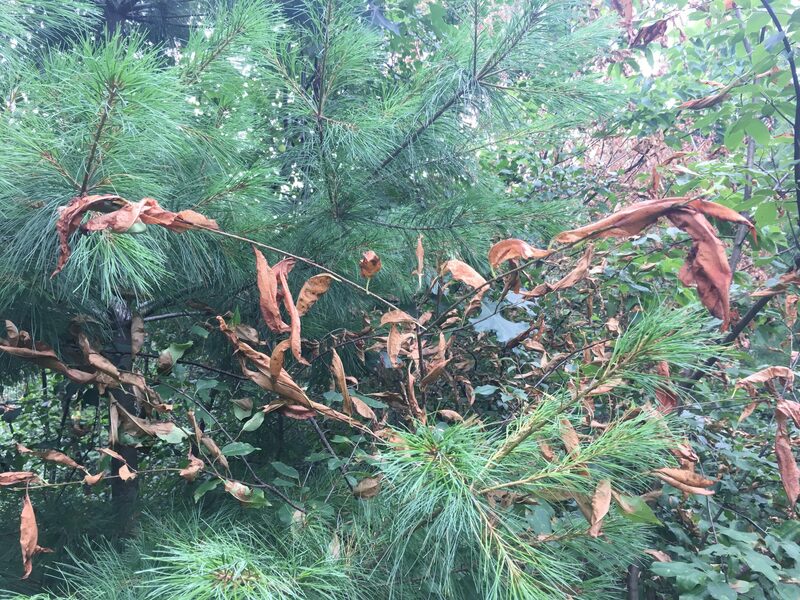 These webbed leaves eventually turn brown, although the tree is not dead. After feeding by caterpillars is done for the season, the mature caterpillars drop to the ground to pupate and overwinter. Defoliated trees may not send out any new leaves this year. Because cherry scallop shell moth is a native insect and trees often recover without intervention, management is typically not needed. Collecting caterpillars or pupae and crushing them or placing them in soapy water for a few days may lower population numbers. Keeping affected trees healthy so they are able to recover is usually the only practical solution.